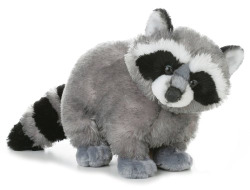 This playful-looking Bandit Raccoon is part of the Aurora Flopsie Collection. It is nicely detailed and very soft. Aurora only uses lock washer or embroidered eyes and nose for safety.